Rhubarb recipes are a dime a dozen, especially if you live in North Dakota or Minnesota, where this perennial vegetable is abundant and church funeral and wedding luncheons are never lacking for desserts made with it. Yes, rhubarb is a vegetable, which doesn’t seem right, since it’s mostly associated with sweet things. (If you’ve ever been to the annual spring Rhubarb Festival at University Lutheran Church in Grand Forks, you know what I mean.) It kind of reminds me of a favorite of mine, the tomato, which is a fruit, not a vegetable. Rhubarb stalks on the plants in our backyard are nearing the ideal size for cutting, chopping and using in sauce or bars or cakes. That’s not to say I have to wait for the first picking of the season to make a dessert with rhubarb, though. I still have several 4-cup bags in the freezer that need to be used before any fresh rhubarb can be picked. So with that in mind, I went in search of a new rhubarb recipe. I was looking for something that could be made from scratch. No cakes mixes or the like. 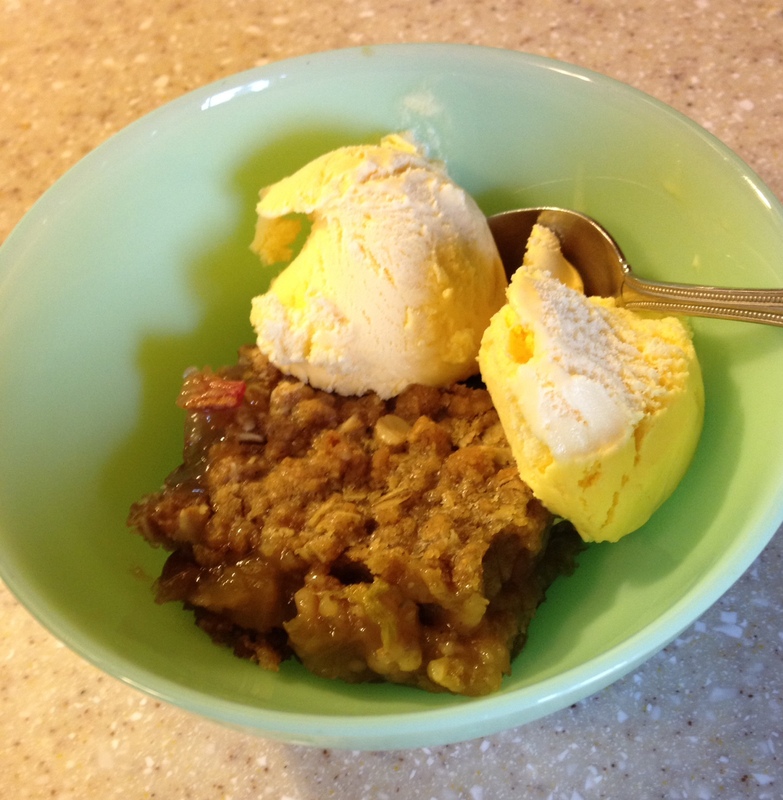 What I found was the following recipe for rhubarb crunch. It was in Calvary Lutheran’s “Heavenly Recipes — Calvary 2000,” a cookbook of 2000 eclectic recipes, some of which were carried over from the original Calvary Cookbook that was printed more than three decades earlier. The recipes included family favorites that had been passed down from parents and grandparents and which were brought from Norway, Sweden, Denmark, Iceland, Germany and many other lands. The cookbook’s editor was a former co-worker of mine at the Grand Forks Herald, Marilyn Hagerty, and the publication was a gift to me from her. I don’t have any qualms about trying anything in this cookbook. Because knowing Marilyn, I’m pretty sure this recipe — attributed to Annette Hauser — must be pretty darned good! Mix flour, brown sugar, cinnamon, oatmeal and margarine and press ½ of it into a 9-by-9-inch pan. Cover with rhubarb. Place white sugar, water, cornstarch and vanilla in saucepan. Bring to a boil. Continue cooking until thick and clear. Pour over rhubarb. Cover with remaining crumble mixture. Bake in 350-degree preheated oven for 1 hour. Serve with ice cream.